ArmInfo. The construction of the Vedi Reservoir and the irrigation system is currently ahead of schedule. "If the pace of construction does not decline, the project will be delivered six months earlier than planned: by December 2020, and not in May 2021," the head of the State Water Management Committee of Armenia Arsen Harutyunyan stated at a meeting with journalists on February 6 in Yerevan. According to Harutyunyan, this winter proved unfavorable for the accumulation of water in the reservoirs of the republic. However, the weather conditions were favorable for the builders, as a result of which the work did not stop for a minute. Since May, the construction of a dam with a height of 85 m will start. As of February 6, as the representative of Water Management noted, 200 people and 100 units of construction equipment are employed at the construction site. Besides, if initially the total capacity of the reservoir was planned at the level of 29 million cubic meters. m and a water surface of 120 hectares, as a result of the work done and without additional costs, the volume of water will be brought up to 31 million cubic meters. The figure is preliminary and may even be increased, the head of Water Management noted. The program for the construction of the Vedi Reservoir, which will soon provide reliable irrigation of 7,500 hectares of land in the Ararat Valley, will cost about 90 million euros. 75 million euros - loan from the French Development Agency, 15 million euros - parallel financing from state budget of Armenia. Construction works of the Vedi reservoir started in March 2017. The implementation of the project will also be of great importance in restoring the balance of the ecosystem of Lake Sevan. 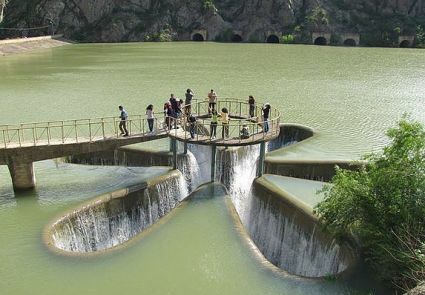 As a result of the construction of the Vedi reservoir, the mechanical irrigation of 2,900 hectares of land irrigated by water companies Vedi and Ararat will be replaced by a gravity system, which will save about 19 million kW / h of electricity, and the area of irrigated land will increase by 300 hectares. As a result of reconstruction of the irrigation network and modernization of the system, water losses, as well as operating and protection costs, will be reduced. At present, system losses are estimated at 40-50%. Upon completion of the program, these losses will be reduced to 15-20%. As a result, the water intake from Lake Sevan for irrigation will drop to 18 million cubic meters m, and the fence from the water channel Artashat - on more than 11 million cubic m. The project was prepared by the French company ARTELIA EAU & ENVIRONMENT and the Belgian SHER Ingenieurs-Conseils together with Jrtuk LLC. The construction is carried out by the Armenian company "Sahakyanshin" (it also rebuilds the Marmarik reservoir destroyed in 1974 and put into operation in April 2012 - ed.) And the Iranian consortium Pega Construбtion.